Brown High School Graduation Stoles. Gradshop offers superb best quality discount brown high school honor stoles that all high school graduates will be proud to wear. The graduation brown honor stoles are elegantly made from great quality bridal satin fabric and shaped to fit all body types. Fully lined throughout the brown honor stoles measures 31" long each side and 5" wide and have neat arrow pointed edges. 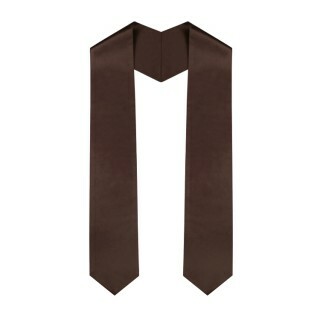 Check out your options when ordering online for discount high school graduation brown honor stoles for great savings for all your graduation attire. I’ve had this brown high school stole for a year now, since my high school graduation. It’s a nice keepsake in itself and brings back fond memories of how it used to be back in secondary school. ‘Tis made from elegant materials and is comfortable to wear. If only I could go back to high school, then I would definitely wear this item again.